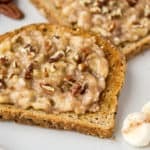 Banana Nut Bread Banana Toast combines all the flavors of this popular bread recipe into a delicious 5-minute breakfast! This is actually my second banana toast recipe! Last week I shared a Honey Cinnamon Peanut Butter Banana Toast recipe that’s based off of one of my favorite flavor combinations – peanut butter and bananas! This week, it’s all about the banana bread! I actually thought for a really long time that I didn’t like banana bread. I don’t remember ever trying it, but I think one too many artificially flavored banana foods made me extremely leery of all things banana for awhile! I do, in fact, enjoy banana bread! It’s just one of those foods that I have to be in the mood for. Luckily, this Banana Nut Bread Banana Toast recipe comes together super fast for whenever the craving hits! For this recipe I simply combine the flavors you commonly find in banana bread, like brown sugar and cinnamon, with banana. Spread it on toast, top with nuts and breakfast is done! I don’t know about you, but I am all about quick and easy breakfasts! I prefer to use grainy breads with visible nuts and seeds, but you can use anything you like. I also strongly prefer to warm the banana mixture right before spreading it on the toast, but again, if room temperature banana works for you, go for it! Toast your bread and have all of your other ingredients out and ready to go! 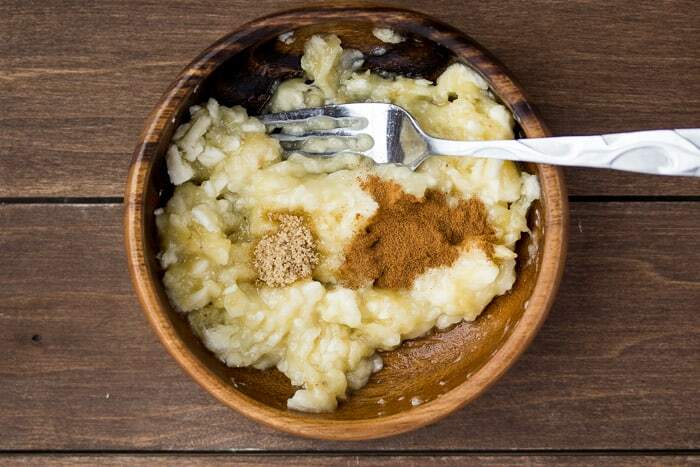 Smash together the banana, brown sugar, and cinnamon in a microwave-safe bowl. Microwave the banana mixture for 15-30 seconds just to warm through, if desired. 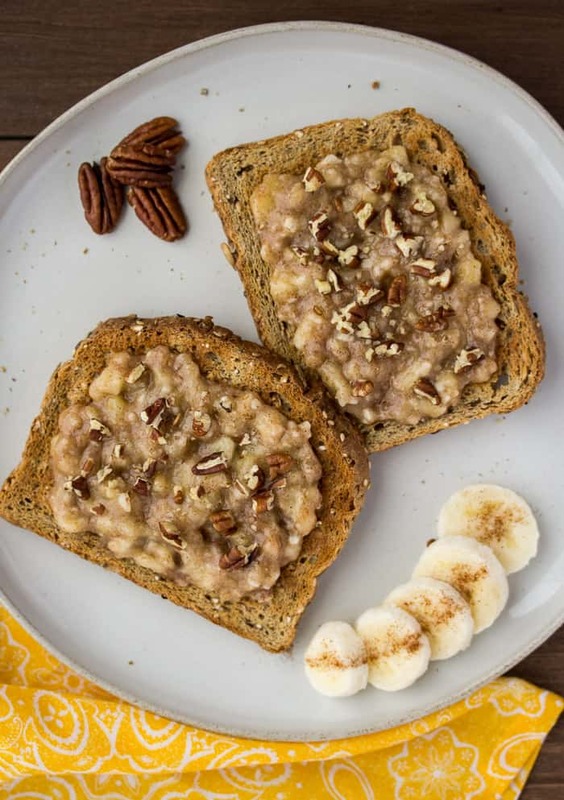 Spread the banana onto the toast and top with chopped nuts of your choice. I used pecans! Love this recipe? Follow us on Pinterest, Instagram, and Facebook for more! 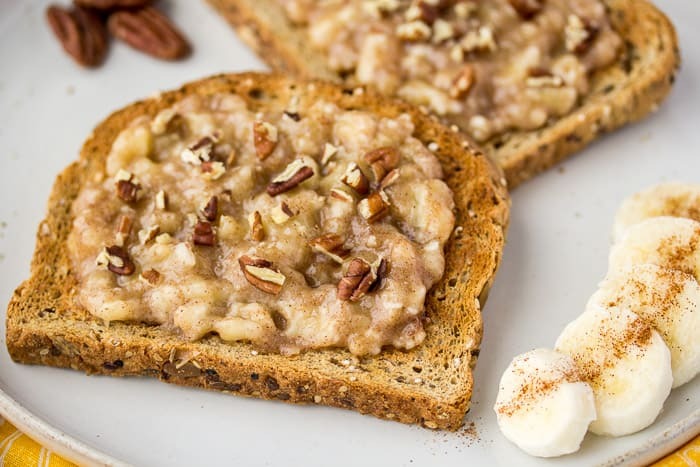 Spread the banana onto the toast and top with chopped nuts of your choice. ** nutritional information is an estimate and will vary depending on the brands you use and any alterations you make to the recipe.